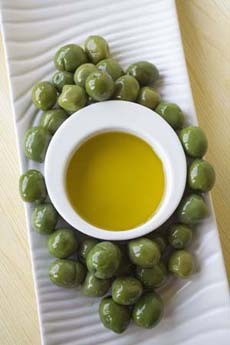 Olive oil, a monounsatured “good fat,” is part of the traditional Mediterranean diet. Photo by Claire Freierman | THE NIBBLE. This is Page 3 of a four-page article. Here we discuss good fats vs. bad fats. Click on the black links below to visit other pages. Not all oils are created equal in terms of how good they are for you. Saturated and trans fats are “out” with diet advisors and health professionals, who suggest that the total amount of fat you eat is less important than the type of fat you eat. Saturated and trans fats increase the risk for certain diseases. The “good” fats—monounsaturated and polyunsaturated fats—lower disease risk. A healthy diet plan substitutes good fats for bad fats. Canola oil is 7% saturated fat, 58% monounsaturated fat and 29% polyunsaturated fat. Olive oil is 13% saturated fat, 72% monounsaturated fat and 8% polyunsaturated fat. For details, see What Type Of Fat Is It?, published by the Harvard School of Public Health. Choose healthy fats, limit saturated fat and avoid trans fat. Fats are categorized via their highest concentration of a particular fat, even though it may be less than 50%. See Page 2 to see a chart of the different types of fats. Learn your fats and eat/cook accordingly. Saturated fats are found in many of our favorite foods. They come from animal sources: meat and dairy products. Examples include beef and beef fat (tallow), lamb, pork and lard, poultry (especially the skin), some seafood (particularly shrimp and crayfish), butter, cheese, cream, ice cream, milk, yogurt and other dairy products made from whole or reduced-fat (1%-2%) milk. These foods also contain dietary cholesterol. Some plant foods, such as palm oil, palm kernel oil and coconut oil, also contain primarily saturated fats, but do not contain cholesterol: No plant foods contains cholesterol. In addition to dietary cholesterol (that which is ingested via food), some cholesterol is produced by the body (blood cholesterol) where it is used for vital purposes—to form cell membranes, some hormones and other needed tissues. But a high level of cholesterol in the blood is a major risk factor for coronary heart disease, which causes heart attacks. Very High Cholesterol: egg yolks and organ meats (kidney, liver, sweetbreads, etc.). Somewhat High Cholesterol: crayfish, shrimp, fatty beef. Medium Cholesterol: lean beef, lamb and pork. Moderate Cholesterol: chicken, turkey and fish contain about the same amount of cholesterol. Eating the skin adds cholesterol and fat calories, since so much fat is attached to the skin. The American Heart Association recommends limiting the amount of saturated fats you eat to 16 grams of saturated fats a day (based on a 2,000 calorie diet). While many companies have removed the trans fats from their products over the past two years, much of it still remains. Read labels and avoid “partially hydrogenated” fats. Read the labels of foods you buy. Some margarines still have trans fats, for example. In restaurants and chains, ask if the restaurant has eliminated trans fat (New York City has made this mandatory). If not, steer clear of baked goods, biscuits and fried foods.